As a holiday nanny, I have had the experience of travelling with a lot of families and can give you an honest answer. “Yes, absolutely!” Even if it only gets used at the airport, I would always recommend taking a travel buggy away with you, especially now with so many ‘z’ folding travel buggies available on the market. Why should I take a travel buggy away with me? Some adapt to car seats. Avoids your day-to-day buggy getting full of sand! It can double up as a shopping trolley for much needed beverages! If you are travelling to a ski resort, also pack a sling, or ask your chalet if they can arrange for an ‘all terrain’ buggy or child carrier to be hired or borrowed for the week. 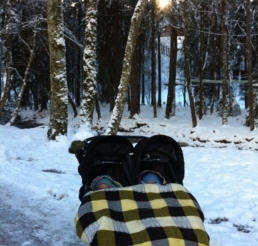 Travel pushchairs are a nightmare in a snowy ski resort! In resorts such as Avoriaz, ski shops also rent sledge buggies, making it easier (and fun) in the deep snow. When choosing a travel buggy, budget, purpose and durability are some of the key factors to be considered. From personal use and research, I have compiled my top 4 travel buggies. If you have had the experience of using any of these, or have other recommendations, then I would love to hear from you. For a second buggy I would recommend the Red Kite, for value for money. If you travel a lot, have a house with limited storage, or enjoy city breaks then I would definitely recommend this pushchair. The Babyzen might be the ‘super yacht’ of travel buggies, but it does come with a price tag! Fantastic for high flying globetrotters! Highly recommended by anyone who can afford the price! The mountain buggy has an innovative range of accessories, including winter ski adapters! Cheaper than the Babyzen, but expensive accessories. Classic travel buggy folding system, if you don’t want to take the buggy on board.